Bowyer finished second in the 2012 Monster Energy NASCAR Cup Series standings and third in the 2008 NASCAR Cup Series standings. He has earned eight NASCAR Cup Series wins and won the 2008 NASCAR Xfinity Series title after leaving his hometown of Emporia, Kansas for racing glory in 2004. He’s NASCAR’s everyman, whose collar is as blue as his Kansas City Royals hat and has a smile as wide as a wheat field. The last two seasons of Bowyer’s career have been quiet, proving how much of a team sport NASCAR is these days while simultaneously testing Bowyer’s trademark smile. Midway through 2015, his two-car Michael Waltrip Racing team announced it was going out of business at the end of the season. Bowyer needed a temporary home in 2016 before joining Stewart-Haas Racing (SHR) in 2017, so he drove for HScott Motorsports, a team that was still early in its development. Results were scarce, forcing Bowyer to persevere until he was back front and center with SHR. He’ll now climb into a car worthy of his skill as he replaces future Hall of Famer Tony Stewart in the No. 14 Ford Fusion. Stewart retired from his NASCAR driving duties upon the conclusion of the 2016 season, ending an 18-year NASCAR Cup Series career that netted three championship and 49 wins. Stewart chose Bowyer as his heir apparent to the No. 14, pairing Bowyer with the meticulous Mike “Buga” Bugarewicz, who in his first year as a crew chief, engineered a victory for Stewart at Sonoma (Calif.) Raceway that put Stewart into the Chase for the NASCAR Cup one final time. Bowyer isn’t the only new addition to SHR in 2017. Since its inception in 2009, SHR has posted 36 victories and two championships with Stewart (2011) and Harvick (2014). And to stay ahead of the curve and continue its title-winning tendencies, SHR announced on Feb. 24, 2016 that it had reached an agreement with Dearborn, Michigan-based Ford Motor Company as its new manufacturer and would field Ford Fusions beginning in 2017. 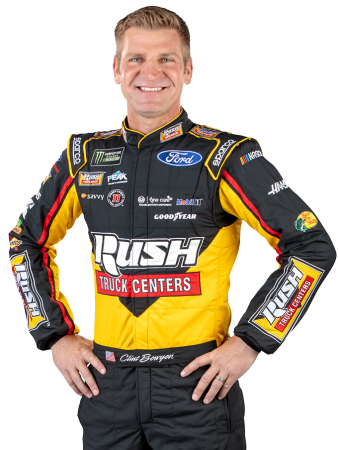 While the team and driver are starting fresh with new Ford Fusions powered by Roush-Yates Engines, Bowyer and the No. 14 team are buoyed by the resources available from Ford. Bowyer’s return to prominence will be a boon to NASCAR. The former dirt racer boasts success on every type of track the series visits. Three of his eight career NASCAR Cup Series victories have come on short tracks, with a pair of wins on restrictor-plate tracks, another pair on ultra-fast 1.5-mile tracks, and a road-course victory. He’s won everywhere and he’s won in everything. He’s twice finished in the top-five in the standings and earned eight victories in NASCAR’s Xfinity Series and three in the Camping World Truck Series. There’s more to Bowyer than his skills behind the wheel of a racecar. Family, roots and racing seem to be at the heart of all of his endeavors. Growing up, their three Bowyer boys were never far apart. Andy, 39, Clint, 37 and Casey, 35, were racing dirt bikes in Emporia dreaming of motocross careers. As they grew older, Andy went to California and enjoyed a successful motorcycle racing career before injury sent his career to the much safer work of race promotor. Clint moved to NASCAR and Casey started a family in Kansas after running a car dealership at the age of 20. As Clint’s NASCAR success grew, he knew he needed help from people he could trust, so Andy and Casey moved to North Carolina to help their brother’s growing career. Casey is president of Clint Bowyer Racing while Andy now works for Feld Entertainment as a digital marketing specialist and host of Supercross Race Day Live. There’s a new generation of post-Kansas Bowyers, as well. Clint and wife Lorra welcomed Cash Aaron Bowyer to the world in October 2014, and joining Cash was little sister Presley Elizabeth in December 2016. A weekend doesn’t go by inside the driver motorhome lot at racetracks when Clint or Lorra aren’t supervising Cash’s laps around the neighborhood in his battery-powered racecar. Bowyer’s current home is in North Carolina, but he hasn’t turned his back on Kansas, especially the 25,000 residents of Emporia. He returns often to deer hunt, visit friends or just be part of the community. In March 2013, he bought the Clint Bowyer Autoplex car dealership on U.S. Highway 50, where he once worked as a lot attendant, dent specialist and detailer. Across the street sits the Clint Bowyer Community Building, constructed in 2012 thanks to a $1.5 million donation from his foundation. Inside are 25 new computers at the public library, a scoreboard at the aquatic center, a video camera at the auditorium, shoes for the Big Brothers-Big Sisters program, backpacks for kids, Christmas trees for needy families, and in nearby towns, playground equipment and the reconstruction of a tornado-ravaged community center – all of it and more paid for by Bowyer\'s foundation, or out of the driver’s own pocket. Bowyer’s loyal to the short-track, grassroots racing that’s prevalent across the country. It gave him his start and he’s paid that luck forward by starting Bowyer Dirt Motorsports (BDM) in 2008 after he built cars fielded in Tony Stewart’s Prelude to the Dream charity dirt Late Model race at Eldora Speedway. Bowyer finished second and Jimmie Johnson finished 10th in that 2008 edition of the Prelude in Bowyer-built cars. In 2010, Johnson won the Prelude and Bowyer finished second in BDM cars. Since its inception, the two-car BDM team has won scores of dirt races and captured the 2014 championship in the Late Model dirt series with driver Don O’Neal. BDM is set to field cars for O’Neal and Darrel Lanigan in 2017. Dirt is where Bowyer came from. He began racing motocross in 1985, collecting more than 200 wins and several championships. After moving from motorcycles to cars with success, Bowyer was gaining a reputation with success at Lakeside and I-70 Speedways in Kansas City. Scott Traylor and some local Kansas City businessmen built and put Bowyer in an ARCA car at Nashville (Tenn.) Speedway in August 2003, and Bowyer led 47 laps before finishing second. Watching on television that night was Richard Childress, who liked what he saw and later called Bowyer, offering him a chance in NASCAR with his Richard Childress Racing (RCR) team. Childress’s call to Bowyer, who was working in the body shop at the car dealership in Emporia is now legendary. A woman with a Southern accent asked if he would take a call from Richard Childress. The woman, who turned out to be Childress’ secretary, said, “No, no, no. I’m serious.” The next voice on the phone was Childress, who laughingly asked Bowyer if he really was about to hang up? “No, sir, no, sir,” Bowyer replied on the other end of the line, stuttering. They story ends with everyone living happily ever after. Bowyer drove in 17 Xfinity Series races for RCR in 2004, then full-time in 2005 and 2006. He won three times, finishing second and third in the standings those years. RCR realized Bowyer’s talent and added full-time NASCAR Cup Series racing in 2006. The following season, Bowyer earned his first career victory at New Hampshire Motor Speedway in Loudon on Sept. 16, 2007 on his way to a third-place finish in the championship standings. After reducing Bowyer’s Xfinity Series schedule so he could concentrate on the NASCAR Cup Series in 2007, RCR returned him to full-time work in both series in 2008 with even better-than-expected results. Bowyer won the Xfinity Series title in 2008, plus the NASCAR Cup Series race at Richmond (Va.) International Raceway in May. In his time with RCR from 2004 to 2011, Bowyer won eight Xfinity Series and five NASCAR Cup Series races. In 2011, Bowyer was in demand in the garage and moved to Michael Waltrip Racing (MWR), where he rewrote the performance expectations of first-year drivers and teams. Bowyer won the road-course race at Sonoma (Calif.) Raceway, then won the Richmond (Va.) International Raceway and Charlotte (N.C.) Motor Speedway races in the fall. Bowyer finished second in points that season. In 2013 at MWR, he posted 10 top-five results on his way to a seventh-place finish in the standings. The 2014 season saw the team and organization struggle, but Bowyer put up five top-five and 15-top-10 finishes. Bowyer’s 2015 season began with promise, but MWR co-owner Rob Kauffman announced in August he was closing the team at the end of the season. That left Bowyer looking for a place to race in 2016. “It was like one door was closing and, as you were getting over the shock, another opened to probably the best opportunity of my life,” Bowyer said, referring to SHR’s decision to hire him to replace Stewart in 2017. While waiting for his 2017 driving duties to begin, Bowyer drove for HScott Racing as he helped the upstart team. The results certainly didn’t reflect his abilities, but Bowyer hasn’t lost any of the skills that made him one of the sport’s top drivers when he was in equal equipment to his competitors. When that happens, everyone will welcome back Clint Bowyer.